Hi, I’m Mark. I’ve been investing RM 1,000 a month into two unit trust funds for almost 9 years. Both funds are recommended by my unit trust consultant who is a close buddy of mine from secondary school. Lately, I’ve checked my unit trust accounts and found that they are worth a total of RM 77,500. I am disappointed as I had already invested a little more than RM 100,000 into these funds. I’ve discussed this matter with my buddy, the unit trust consultant. He reckoned that I should remain committed with my investments into the two funds as they are meant to be ‘long-term investments’ to fund my living expenses after I have retired in the future. He also commented that I would definitely ‘lose money’ if I decide to dispose my funds today at a loss. As I’m writing this, I’m still at a loss to what I should do with my funds. Thus, my question is: ‘Should I continue to invest RM 1,000 a month into these two funds or should I dispose them and reinvest my proceeds into ‘somewhere else’? First, it must have ‘sucked’ to suffer losses after years of ‘diligent’ investing into a vehicle that you ‘trusted’ to be a solution to your money problems in years to come. It is natural to feel disappointed and have the ‘desire’ to start the ‘blame game’ for your investment losses. So, should Mark blame his buddy for recommending him funds that caused him to lose his money? I believe, the answer is ‘nope’ and pointing fingers at his consultant is definitely not helpful to recover the losses from his unit trust funds. If you happen to be a ‘Mark’ today, let us not cry over spilt milk. Instead, let us try to learn something from this experience so that you will emerge wiser in the subject of investing. 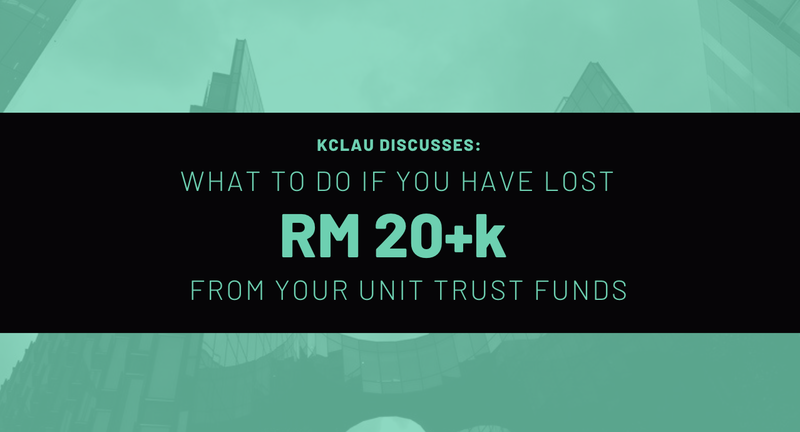 Here, I’ll share 3 quick pointers that are very helpful to understand how you got yourself into unit trust and more importantly, how to turnaround today’s losses into future profits from your next investments by becoming a better investor. Consultant: ‘How about ABC Fund which ‘makes’ an average of 8% per year’. Today, it is common for one to compare returns offered by unit trusts with FDs and EPF. Often, many sincere ‘investors’ are convinced to put their money into unit trust funds as they are informed that their returns are ‘superior’ than how much returns are being offered by both FDs and EPF today. Let us say, you decided to take up a FD promotion of 4.2% a year by placing RM 10,000 into it, you are ‘more or less’ guaranteed RM 420 in returns after 1 year. The RM 420 in interest received is a form of ‘cash flow’. Whereas, when your consultant reckoned: ‘Bro, ABC Fund ‘makes’ around 8% a year, on average, for the last 3 or 5 years.’ Perhaps, you should ask: ‘What does it mean? Was it ABC Fund paying out RM 8 in income (cash) from every RM 100 invested into the fund? Or, was it an appreciation of unit price of ABC Fund by a rate of 8% per annum?’. If the answer is latter, then, the 8% return is basically a return in the form of ‘capital gains’ but not cash flow. – A Cash Payout of 8% per annum from your unit trust funds? – A Capital Gains of 8% per annum from your unit trust funds? #2: So, How Does it Make Money for You? Here is my Question #2 for you: ‘Would you care to explain how does your unit trust funds make money?’. Let me explain. For instance, if I invest in properties, I would expect to make my money from rental collections and price appreciation as a result of rising cost of building properties (land, raw materials, labour, related professional fees … etc) and rising affordability levels among locals in the neighbourhood. Or, if I invest in a stock, let’s say Maybank as an example, it basically means that I have become a shareholder (although a very insignificant one ….) of Maybank. I would expect it to make money from its lending activities (interests earned by providing mortgages, car loans, credit cards, personal loans … etc) to its pool of borrowers. So, what about your unit trust funds? How do they make money for you? What assets do they own which bring regular income (cash flows) to your funds? Are you able to explain how these funds make money for you to a 10-year old kid? If you do not know, do not feel bad about it. This is because most people do not know either. Many adopt an attitude of investing where it involves parking your money into ‘something’ and hope that they would grow into a much larger sum of money in the future. Most people do not want to learn how that ‘something’ actually work or have the ability to make money for you. Thus, many ‘invest’ and forget about it until when they need their money. Hence, instead of putting the blame on your unit trust funds, more accurately, I think it could be fair to say that you were the ‘risky investor’ who had taken the risk of buying into your unit trust funds without fully understand them, agreed? Point #3: Is Unit Trust a Long-Term Investment? – The Income Generating Ability to Make Money Regularly. – The Duration of Holding Onto an Investment. Here is what you could be ‘envisioning’ when you buy units of a unit trust fund. First, you exchanged money with units of your preferred fund and thus, making you one of the fund’s unitholder. The fund received your money and would use it to buy shares (if the fund is an equity fund). As an unitholder, you hoped that these shares are held for the long-term for income and capital gains, right? If a fund has 10 stocks and retains all of the 10 stocks in its portfolio after a year of investing without buying or selling any stocks in the stock market, hence, the fund has a PTR of zero. It does not mean that the fund itself is good or bad. For instance, if the 10 stocks owned by the fund are good, then, the fund is good. If the 10 stocks owned by the fund are bad, then, the fund is bad. A key advantage for a low PTR fund is – You have a chance to assess, whether or not, the assets owned by the fund are good or bad as its fund managers do not change the fund’s composition of assets regularly. In short, this means that you have a better chance of understanding what you are buying into before buying. However, if a fund has 10 stocks and its fund managers are actively buying and selling stocks, after a year, the same fund now holds 20 stocks which are totally different from the initial 10 stocks originally held a year ago, then, the fund is a high PTR fund. How then is it possible for high PTR funds to be long-term investments if these funds keep on buying, selling and trading stocks for short-term gains? In fact, it is common for many to sincerely believe that they are ‘investing’ for retirement when their fund managers are trading stocks for trading gains. So, did you ‘invest’ your money into a PTR Fund? Perhaps, you should ask your consultant for its latest brochure. If your consultant happens to be one who do not know what PTR is, I reckoned that it is about time for you to ‘fire’ your own consultant. Kidding! But personally, I have a hunch that most consultants today do not know what PTR stands for and how it impacts your ‘investments’. Conclusion: So, what should I do? Buy More, Keep, or Dispose? My answer: ‘I don’t know, if you’re Mark, what should you be investing into. My question to you is – ‘Are you a good stock investor?’ If you are, then, you should invest in stocks. But, if you are not, please stay away from it. The same goes for properties. If you are not into real estate, please also stay away from it. The next question I have is – ‘Are you interested to learn about investing?’ If you are interested, then, it is good to spend some time to read investment books or attend seminars and workshops conducted by true investors. But, if you are not interested to learn about investing, then, it is best for you to put your money in FD accounts or to pay off your consumer debt (bad debt) or to have it ‘invested’ back into your business if you are running one …..should you decide to dispose your unit trust funds. There is a huge difference between cash flows and capital gains. Do not confound the two. Investors would find out about an investment in great detail first before investing their money into it. Investors can explain how their investments are capable of generating a regular stream of income (cash flows) into their bank accounts. Investing involves a lot of studying, researching, and learning. If you are not interested in them, please do not ‘invest’ your hard-earned money. « Previous Post John Bogle and The Evolution of Low-Cost Investing Next Post » Should I take Cash Advance for Investments? 2 replies to "I Lost RM 20+k in Unit Trust. What Should I do?" It’s okay to have your opinion on investing. Everyone is entitled to their own. It is also okay to feel disappointed with my write-up. I’m also okay with that. I believe, KCLau.com is a place where all are united to exchange ideas about finances and investments in a positive manner. So, all constructive feedback are welcomed. If you are doing well with your investments in unit trust, awesome! We are happy for you. In regards to ‘reading a lot’ before investing, you may call me ‘a fool’ as I do read a lot about something before I invest into something. I have many ‘foolish’ friends too so I’m not alone. I supposed, Warren Buffett, the world’s legendary investor, is probably the most foolish as I learnt that he has a storeroom filled with annual reports of thousands of stocks listed in the U.S and he reads them a lot on a daily basis. But, I’m here for all who had lost money in unit trust funds / any type of ‘investments’. My message is simple: If you lost money in an investment, it is, perhaps, you are investing your money without having adequate amount of knowledge / expertise in that investment in the first place. Investing is more than just knowing ‘where to park your money next?’ or ‘what to do?’. It can be a lifestyle where you are a student of money and have a sincere desire to improve your skills as an investor. Hopefully, some of you get the message. What? Mark has been investing for 9yrs in a UT that he trust/whatever. I know my unit trust manager invests the summed pool into equity 30%, bonds 20%, etc etc. The question was even if I knew what my unit trust is doing what do I do when I’m at a loss? You went on and on about it and at the end left it without any strong guidance to think. How long should someone be readin before they can invest nobody knows everything, only a fool does. Very disappointed with this article. Investing is risk, as an investor know the risk and if you’re up for it go ahead if not go home .